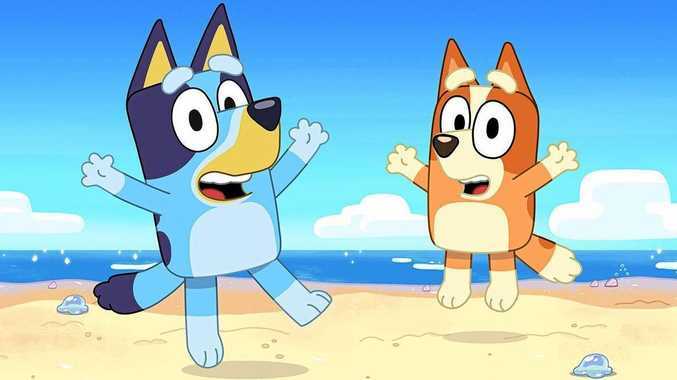 Animated children's series Bluey is fast becoming an Aussie icon. IF YOU have children under 10 years of age, you know that watching something that is entertaining for everyone, funny, sweet, educational and just plain wonderful is rare. On top of that make it Australian and the content becomes a gem your family will be loyal to forever. This week my family was introduced to Bluey. Bluey is an inexhaustible six-year-old blue heeler dog who loves to play and turns everyday family life into extraordinary adventures, developing imagination as well as mental, physical and emotional resilience. Bluey's mum and dad are fantastic role models, but they still want to drop the kids to watch the cricket, have time for a run in the arvo, let the kids play with water on a hot summer day and all this with the most fantastic Australian accents. I watched the TV show with my four children for the first time recently and I think I have never seen the whole family giggling so hard. Bluey reflects the learning patterns, experiences and lives of regular Aussie kids on the East Coast of Australia: the jacaranda or poinciana trees are blooming, the outdoor barbecue is a larger family or community meeting ritual and, oh my, they live in a Queenslander-style house. This is why we need to support our artists: they reflect our stories and our culture. They record our experiences for future generations to share, and they tell our kids, no matter where they are in the world, that they come from a place called Australia that will always be home, no matter how far away they are. Principal production investment from BBC Studios, Australian Broadcasting Corporation and Screen Australia. Bluey is available on ABC 2 and iView.